Download PDF Button / Circle / Small Gray / Download Created with Sketch. 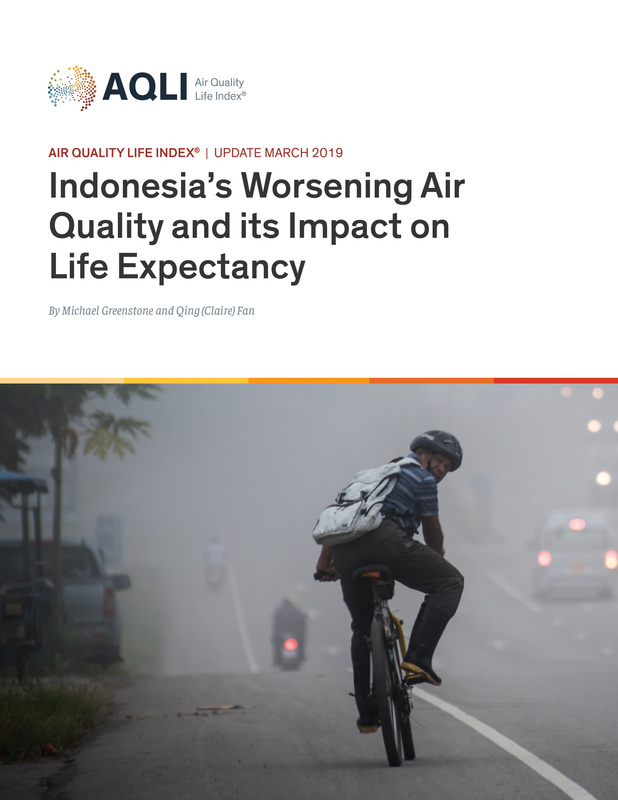 The average Indonesian can expect to lose 1.2 years of life expectancy at current pollution levels, according to the Air Quality Life Index (AQLI), because air quality fails to meet the World Health Organization (WHO) guideline for concentrations of fine particulate matter (PM2.5). The loss of life expectancy in some regions is more than 4 years. Thailand is today the world’s seventh most polluted country. 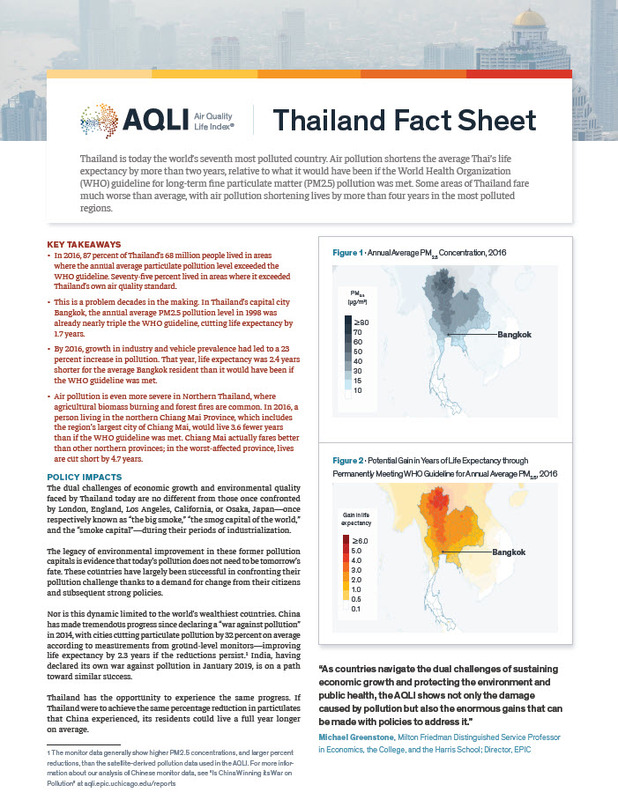 Air pollution shortens the average Thai’s life expectancy by more than two years, relative to what it would have been if the World Health Organization (WHO) guideline for long-term fine particulate matter (PM2.5) pollution was met. Some areas of Thailand fare much worse than average, with air pollution shortening lives by more than four years in the most polluted regions. Pakistan had the fifth most polluted air in the world in 2016, due mostly to vehicular and industrial emissions and crop burning. 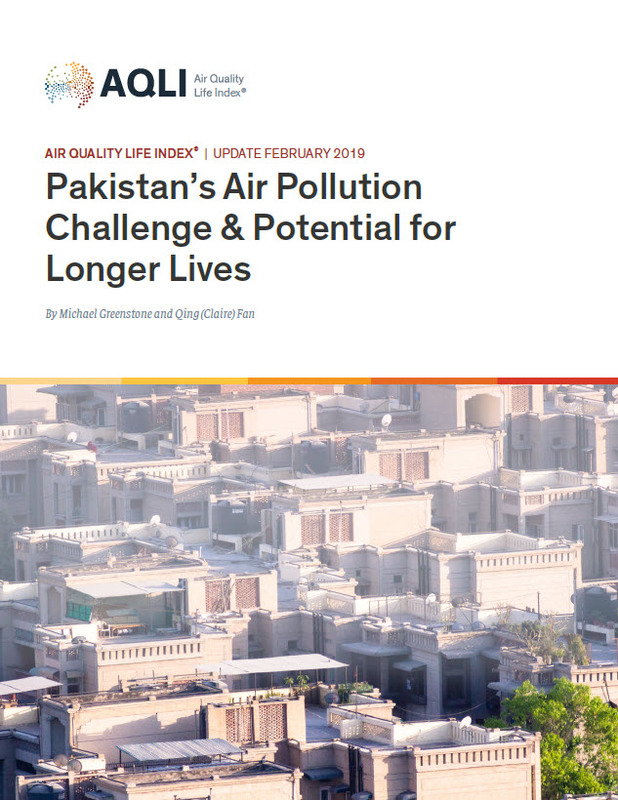 If sustained, this air pollution would cut 2.7 years off the lives of the typical Pakistani, relative to what their life expectancy would be if the World Health Organization (WHO) guideline was met; and 2.2 years relative to its own air quality standard. The district of Lahore suffers the worst, with the average residents losing 5.3 years off their lives, relative to the WHO guideline. As the government begins to confront the air quality problem, this analysis shows that Pakistan has the opportunity to vastly clean up its air. If the country achieved sustained improvements in air quality comparable to what China has achieved in recent years, its residents would live 1.2 years longer on average. Those in Lahore would live 1.9 years longer. 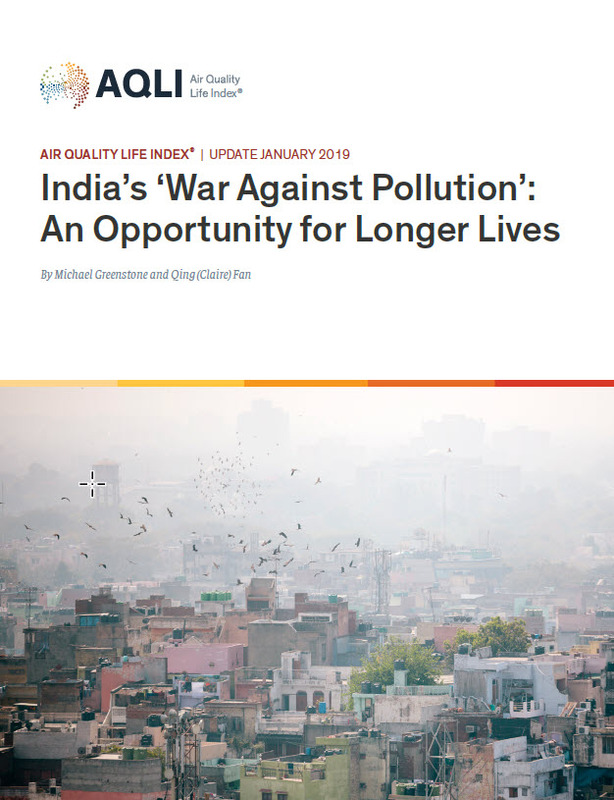 In 2019, India declared a “war against pollution” and launched its National Clean Air Programme (NCAP), signaling its desire to reduce particulate air pollution—the greatest threat to human health on the planet. The Programme, which aims to reduce particulate pollution by 20-30 percent nationally, will be implemented over the next five years. If successful in meeting its goals and sustaining the reduced pollution levels, the NCAP would produce substantial benefits, extending the life expectancy of the average Indian by about 1.3 years. People breathing the most polluted air—namely those in Delhi and parts of Uttar Pradesh—could live up to 3 years longer. Further, the NCAP highlighted 102 cities containing about one quarter of the country’s population that fell short of India’s air standards. If all the cities permanently reduced particulate pollution by 25 percent (the midpoint of NCAP’s goal), their residents would gain 1.4 years. Though achieving the NCAP’s goals would be an important step toward reversing India’s 69 percent increase in fine particulate pollution (PM2.5) concentrations since 1998, India could achieve further gains in life expectancy for its citizens through additional pollution reductions that bring the country into compliance with its own official air quality standards or the World Health Organization’s (WHO) guidelines for PM2.5 concentrations. Over the past two decades, air pollution has emerged as a serious challenge in China. Between 1998 and 2013, a time of historic economic expansion, concentrations of particulate pollution increased by nearly 75 percent on average across the country, rising to more than four times the World Health Organization’s (WHO) safe level. In many areas, particularly in China’s densely populated northeast region, the increases were much larger. At 2013 levels, particulate pollution exposure reduced life expectancy by 3.4 years for the typical Chinese citizen. The United States once struggled with heavy air pollution. Before 1970, the Steubenville, Ohio metropolitan area had particulate pollution concentrations similar to those in Beijing in recent years. Los Angeles had become known as the smog capital of the world, and other large metropolitan areas weren’t far behind. Pollution had become a part of everyday life for many Americans, and citizens made clear that they wouldn’t tolerate it any longer. Congress passed the 1970 Clean Air Act and air quality has vastly improved across the country since then. 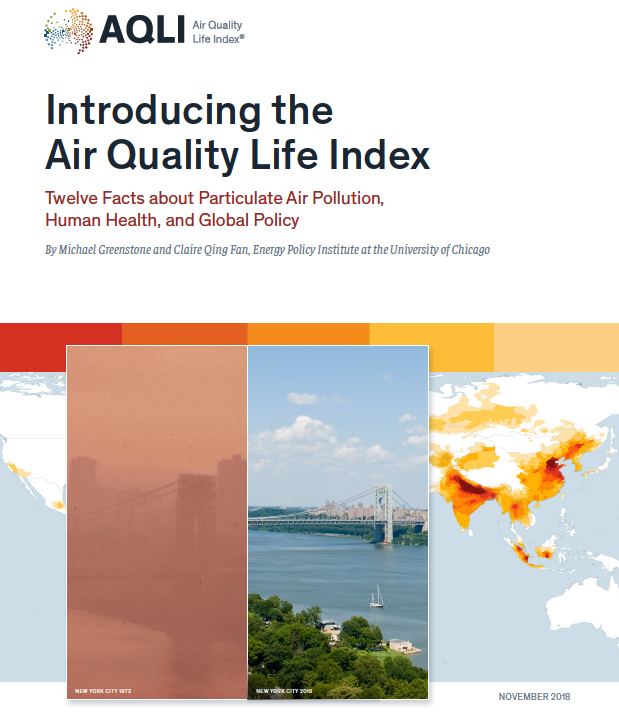 Today, most of the country enjoys clean air, and the reductions in particulate pollution have improved life expectancy for the average American by 1.5 years. Since the pollution that is easiest to reduce is reduced first, the majority of the air quality improvement came in the years immediately following the passage of the Clean Air Act. Of the reductions since 1970, 15 percent has come since 1998, which the AQLI tracks. Pockets of high particulate pollution, however, still exist in some areas today. India is today the world’s second most polluted country, slightly trailing only Nepal. 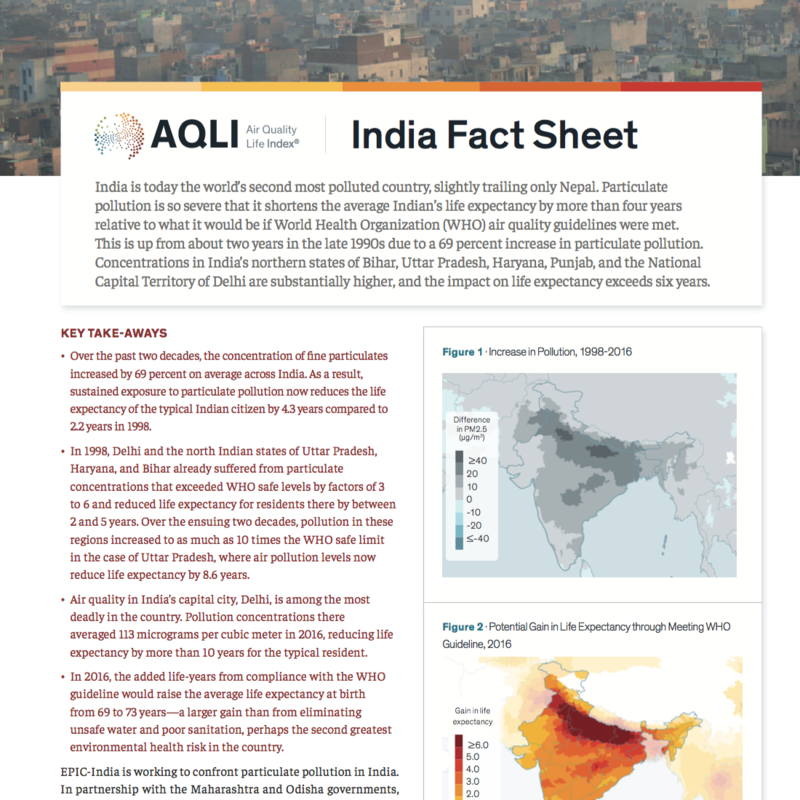 Particulate pollution is so severe that it shortens the average Indian’s life expectancy by more than four years relative to what it would be if World Health Organization (WHO) air quality guidelines were met. This is up from about two years in the late 1990s due to a 69 percent increase in particulate pollution. Concentrations in India’s northern states of Bihar, Uttar Pradesh, Haryana, Punjab, and the National Capital Territory of Delhi are substantially higher, and the impact on life expectancy exceeds six years. 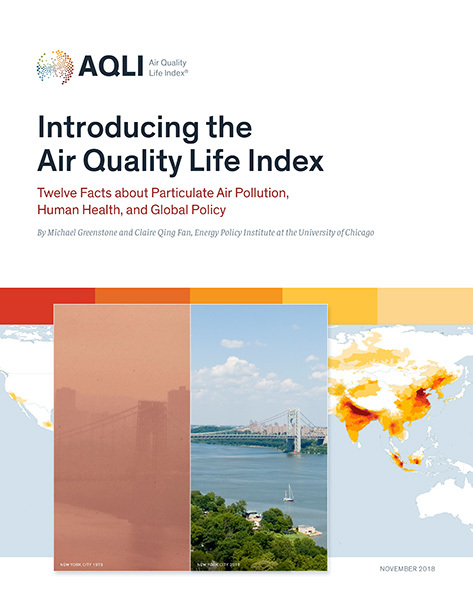 The Air Quality Life Index, or AQLI, represents a completely novel advancement in measuring and communicating the health risks posed by particulate matter air pollution. This is because the AQLI converts particulate air pollution into perhaps the most important metric that exists: its impact on life expectancy. 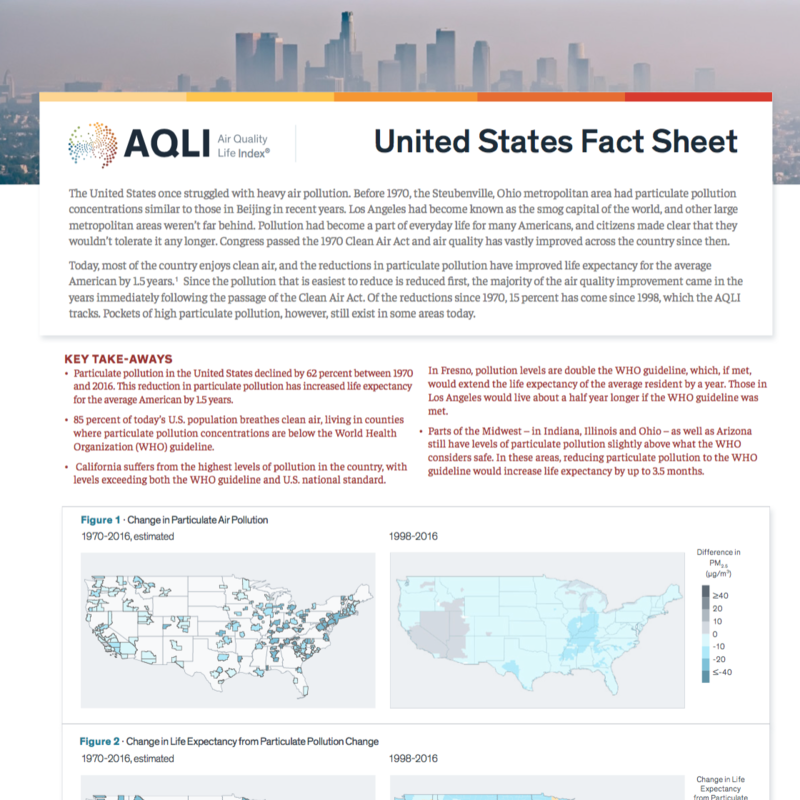 The AQLI reveals that, averaged across all women, men, and children globally, particulate matter air pollution cuts global life expectancy short by nearly 2 years relative to what they would be if particulate concentrations everywhere were at the level deemed safe by the World Health Organization (WHO). This life expectancy loss makes particulate pollution more devastating than communicable diseases like tuberculosis and HIV/AIDS, behavioral killers like cigarette smoking, and even war. Is China Winning its War on Pollution? Four years after Chinese Premier Li Keqiang declared a “war against pollution,” has the government delivered on its promises to improve air quality? 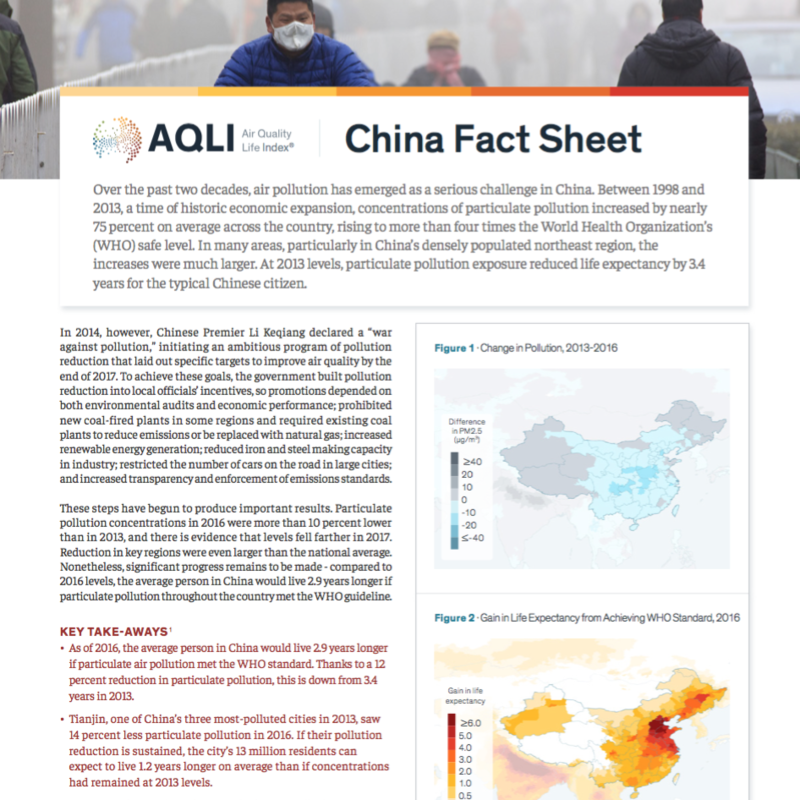 Using daily data from more than 200 monitors across the country from 2013 to 2017, we find that China’s most populated areas have experienced remarkable improvements in air quality, ranging from 21 to 42 percent, with most meeting or exceeding the goals outlined in their National Air Quality Action Plan. If these reductions in pollution are sustained, the average Chinese citizen would see their life expectancy increase by 2.4 years relative to 2013. 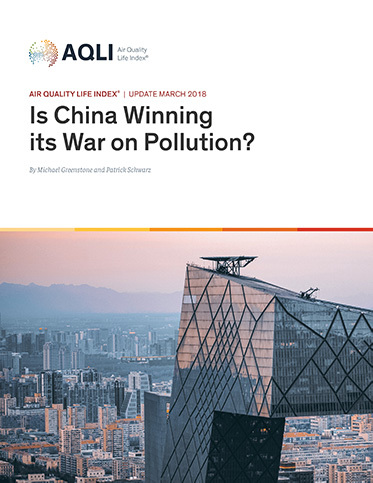 Although China faces a long road ahead to reach national and international air quality standards, these results suggest the country is winning its war on pollution.